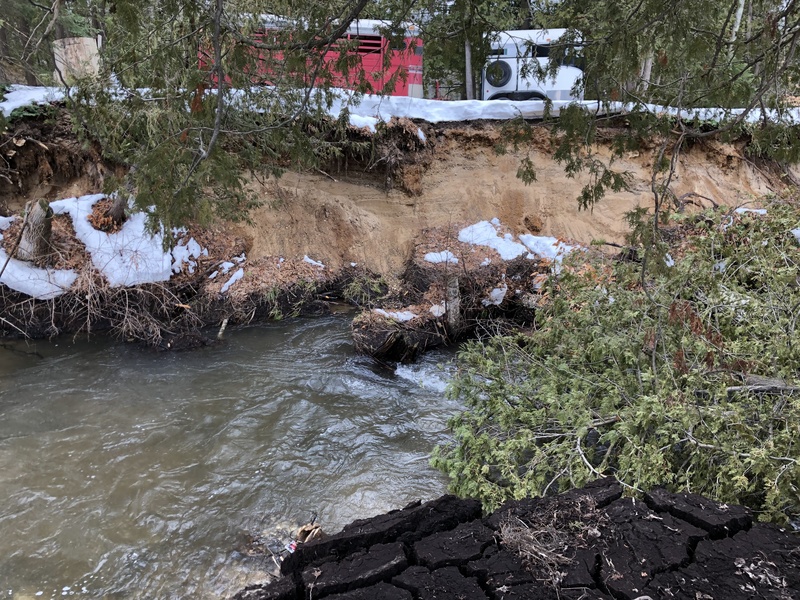 Friday evening March 15, 2019, after Thursdays daytime high of 57º, coupled with snowmelt and rain, a dam located behind Weiss Acres along 131 gave way and washed out. The site was an old grist mill from many decades ago. The dam had been on the radar of local MVWTU and CRA for a few years. Property owners were hesitant to do anything about the possibility of an aged dam but now wish they had. 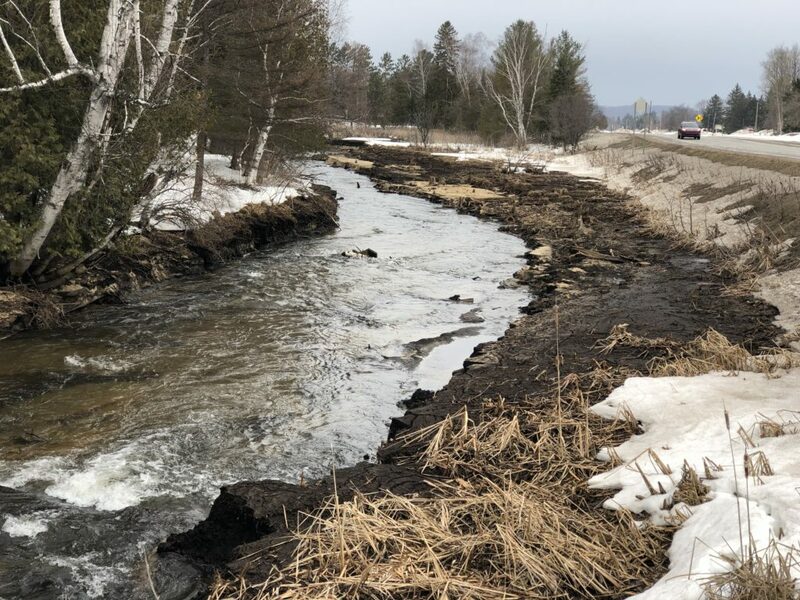 There are cabin rentals along the river bank where vacationers could kayak up a couple hundred yards in slack water before they ran into two undersized culverts on the former entrance to Boyne Mountain, opposite Cherry Hill Road. This site was also looked at by Tip of the Mitt Watershed but complications and funding delayed removal because of buried utilities. The amount of sediment washed down stream is yet undetermined. Fish kill and macro invertebrate collateral damage is unknown. Biggest concern is young of the year brown and brook trout that may have little recourse in escaping plume of silt or heavy flows. The DNR, DEQ, and Tip of the Mitt have visited site along with Little Traverse Bay Tribe- who took water samples on Tuesday. 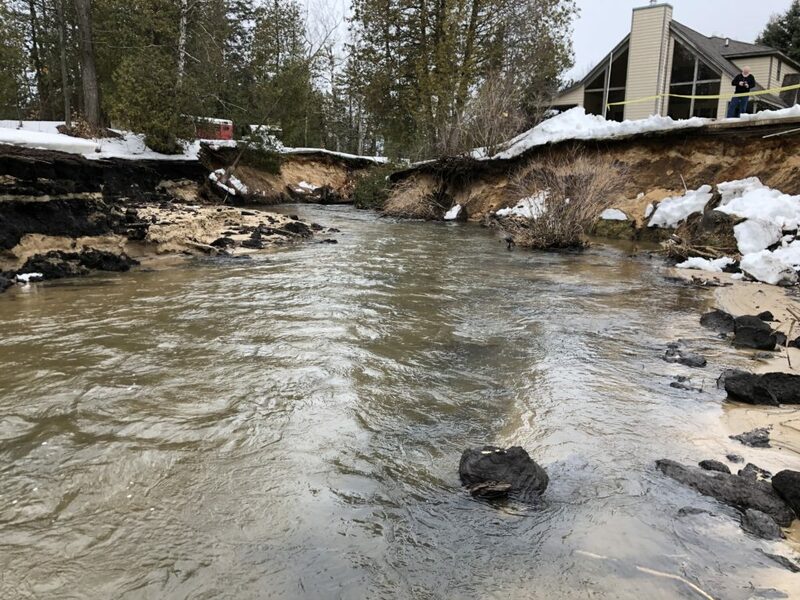 A crew of surveyors from Ehlmer’s Construction- general contractors on Maple River and Boardman River dam removals, were also on hand and forecast an involved remediation of river and hope for a quick recovery. The portion upstream is high quality trout stream, below former dam site is the Boyne Falls Mill Pond, which may have acted as a large sand trap. 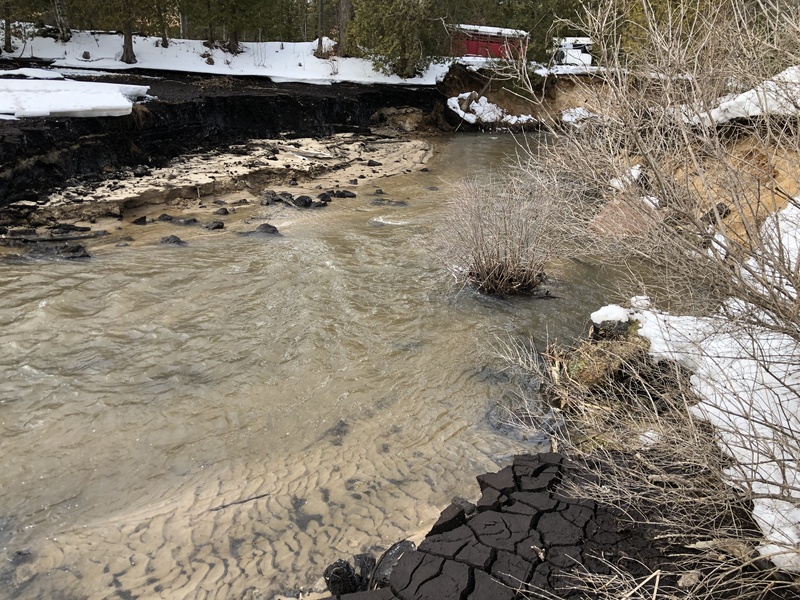 There is also evidence that when the dam broke free, the amount of water and sediment going downstream would have stirred and flushed the still water in the pond- pushing a larger plume of silt downstream. The turbid and murky water was visible for 4-5 days in Boyne City. The river has been through this before. 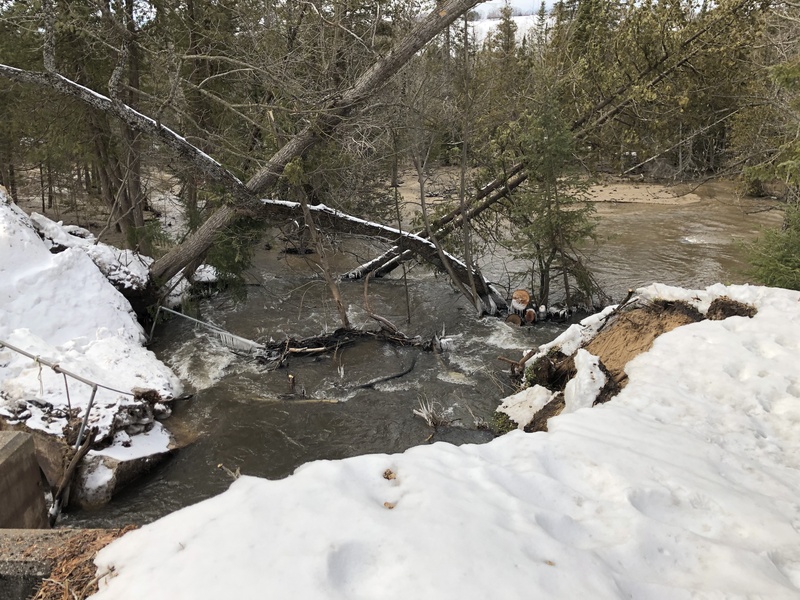 In October of 2016, while performing routine maintenance on the Boyne Property Dam at Kircher’s pond, a log became lodged in the floodgate and most of impounded water was released downstream. Anglers who were in the river fishing for salmon noticed the river suddenly rush from knee deep to over their waist’s and became very murky. 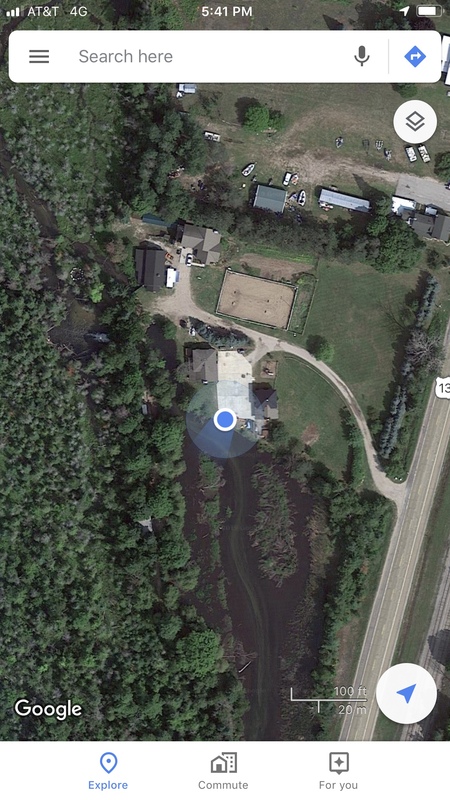 Some actually caught pike and large browns that were residents from the impoundment. Some property owners had to retrieve kayaks that were along their shoreline to be found in the mouth of Boyne at Lake Charlevoix. There are over 2,500 dams in Michigan, many of which are outdated and approaching the end of their lifespan. These dams can have adverse effects on wildlife and fish populations. Not only to dams prevent fish form reaching cooler water in times of thermal stress, they also deter migration of spawning salmonids and increasing surface temperature to detrimental climates for many sensitive macro-invertebrates. Huron Pines has a list of dams they have been working on. 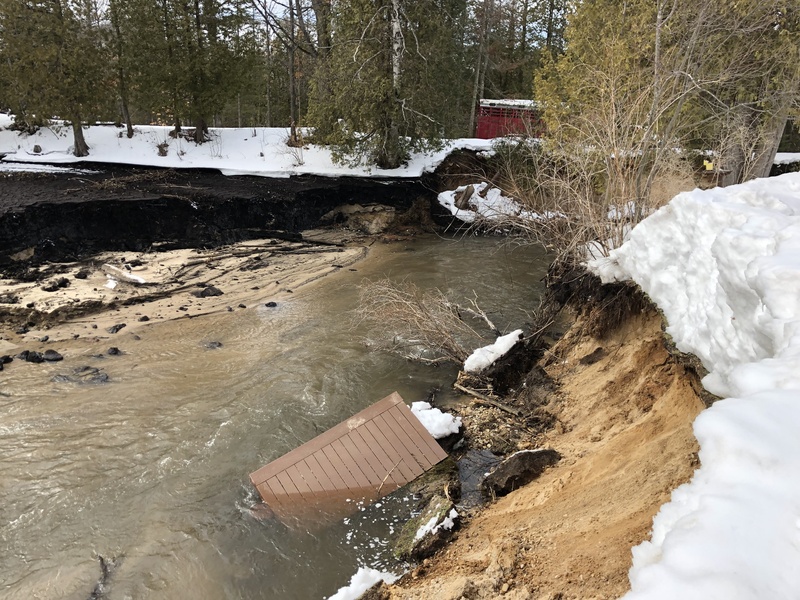 MDOT and DEQ recently evaluated the dam in Boyne Falls at M-75 and it was marked ‘satisfactory’. Neither parties felt there was strong public support for removal of dam at the time, perhaps with this incident, a new conversation can begin. Property owners at Weiss Acres are very concerned about liability and possible fines from DEQ and would like to cooperate in any way possible- hopeful for a better river in the future. It is going to take a lot of combined efforts and money from various parties. My hope in writing this is to gain public attention to many aged and failing dams across the state. Also, to see if this reaches other news publications to gain some traction and possible sources for funding repair of this beautiful trout stream. 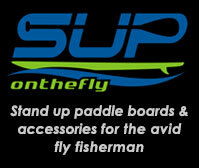 Let’s share this and get the word out- we need more rivers to flow freely.